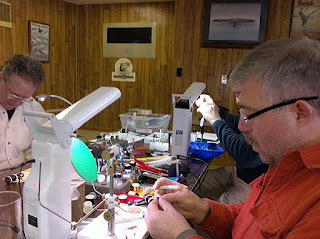 Don Bastian is hosting a Tying Trout Flies - Fly Tying Class on March 2 - 4, 2012 at Fishing Creek Angler Fly Shop and Bed & Breakfast. 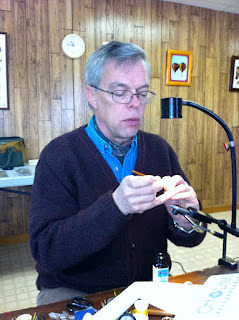 I highly recommend Don's classes (see Tying Classic Wet Flies with Don Bastian). Don's students hard at work. Here is the write-up Don sent me. 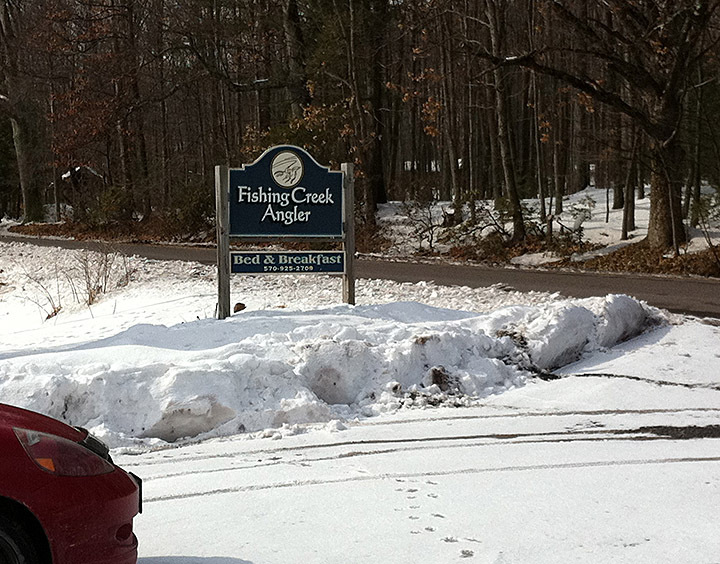 Fishing Creek Angler provides a perfect location in a lovely north central Pennsylvania rural setting for a winter weekend fly tying class. The Fishing Creek Angler Bed & Breakfast is beautifully appointed with solid wood walls, floors, and trim, with an open cathedral ceiling and spacious Great Room and dining area. There are four bedrooms to accommodate eight guests. Participants can enjoy the fly shop, bed & breakfast, and classroom without leaving the building. Bring your slippers! These classes provide an educational and fun opportunity to learn from Don Bastian’s instructional expertise, knowledge, techniques, and commercial fly tying experience acquired during 48 years of fly tying. A wide variety of specialized procedures and material applications for tying all types of trout flies will be presented in this class. 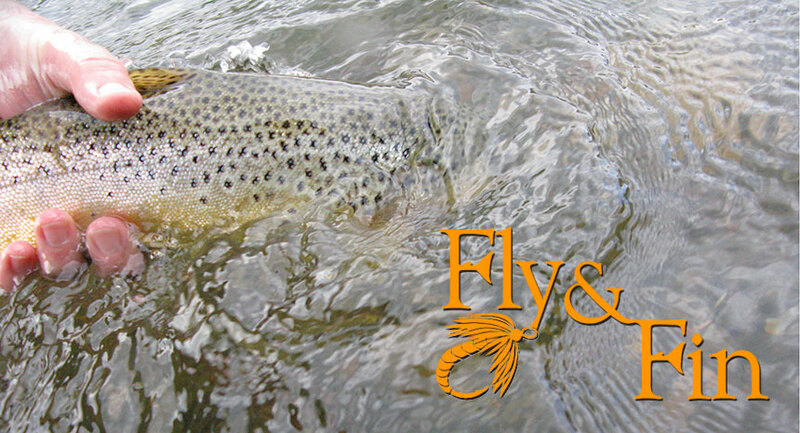 Dry flies – Comparaduns, parachutes, Marinaro Thorax Duns, Spinners, Catskill drys, Wulffs, etc. Multiple methods of applying and using hackle, tailing materials, and dubbing. 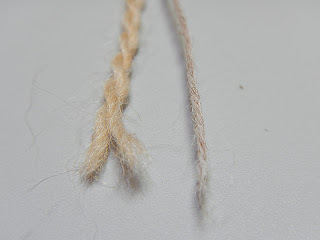 Tips, tricks, & techniques for working with a wide variety of tying materials. Proper proportions, material selection, grading, application, & use. 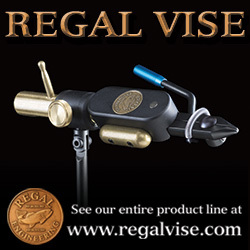 Instructional expertise to help solve your fly tying problems, challenges, and difficulties. Student requests welcomed! We will be tying drys, soft-hackles, nymphs, spinners, streamer & bucktail patterns, emergers. Friday evening dinner featuring Mary-Ann’s lasagna with salad, garlic bread & home made dessert. Full breakfast of bacon, eggs, and toast - Saturday & Sunday. Lee’s Saturday evening steak Bar-B-Q with baked potato, salad, & home made dessert. Two nights double-occupancy lodging at the Fishing Creek Angler Bed & Breakfast. Relaxing evenings in the B & B with your favorite libation; lots of fly tying talk and informal tying sessions. Saturday class runs from 9:00 to 5:00 PM with a break for lunch. Sunday session is from 9:00 until noon. Attending students must bring vise, light, tools, and a list of materials (provided upon reservation). Check-in is anytime after 1:00 PM on Friday March 2nd. Come early to browse in the Fly Shop or simply relax, meet new friends, tie a few flies, and enjoy your favorite beverage. Feel free to bring beverages of your choice. Contact Don Bastian via e-mail at: dwbastian@chilitech.net with specific questions or requests. Don Bastian has forty-eight years fly tying experience including a decade long stint as a commercial tyer. He has nearly 765 classic wet fly, streamer, and bucktail patterns published in the book Forgotten Flies. Tying Classic Wet Flies was released in November 2004. 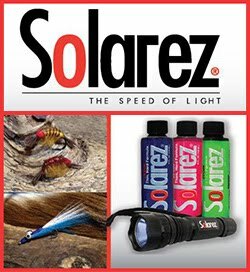 In August 2007 two more Don Bastian DVD’s were released - Advanced Classic Wet Flies, and Traditional Streamers and Bucktails. 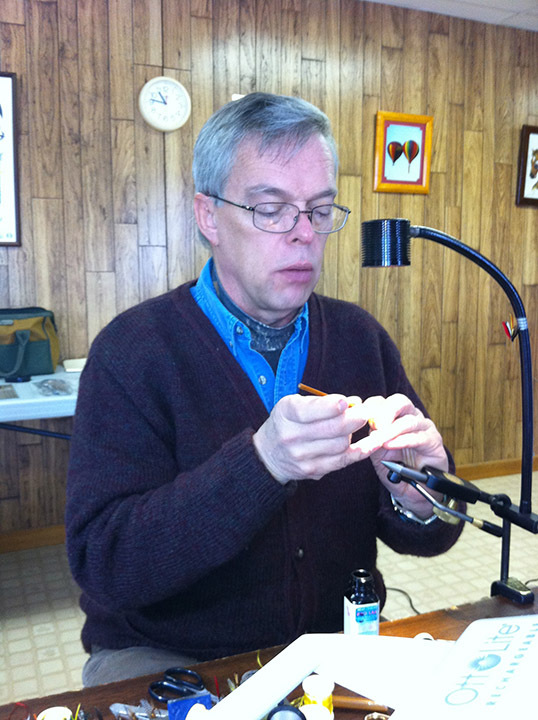 He has been a fly tying instructor for over twenty six years. References are available. Attending students are required to have some fly tying experience. Daniel Galhardo of Tenkara USA demonstrates and teaches Tenkara casting techniques at the Somerset Fly Fishing Show. 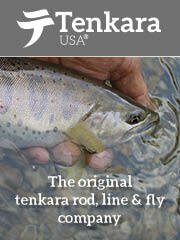 Ask you can seen in this video Tenkara involves casting not lowering your fly in to the water (dapping). In order to dap (traditionally) you need wind to position the fly on the water and help make the fly bob on the surface. 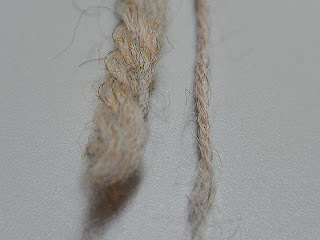 In Tenkara you are casting in much the same way you cast a western fly rod. The difference is you have a fixed amount of line. With that fixed line you can deliver your fly with pin point accuracy, something you can't do when you "dap." First, thanks are in order to Richard, a.k.a. Regular Rod at Dry Fly 'Expert'. If it was not for his generosity and kindness, I would not have a sample of Chadwick's 477 to use as a reference. Many readers of the blog know I've been searching for a Chadwick's 477 mending yarn substitute. While Veniard sells a good substitute for the yarn used in Frank Sawyer's Killer Bug, I would never know if it was close. 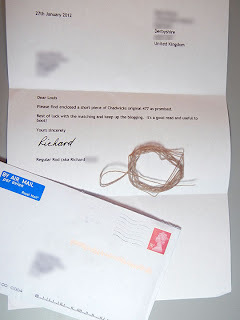 I've never seen the genuine article until Richard sent me the sample. It's been a small obsession to find a substitute for Chadwick's 477 starting with me getting Frank Sawyer's Nymphs and the Trout published in 1958 by Stanley Paul & Co. and Oliver Edwards video Essential Patterns. 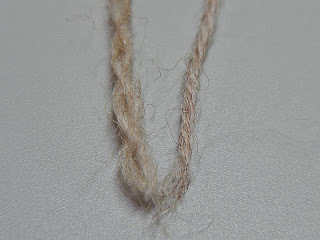 I've used Rag wool from an old sweater (Rag Bug) before locating a source of Veniard's Chadwick's 477 substitute (Killer Bug Yarn). 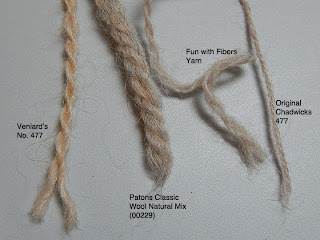 Next I found a bag of "Fun with Fibers" yarn while cleaning out an old crafts locker (Possible Chadwick 477 Substitute). 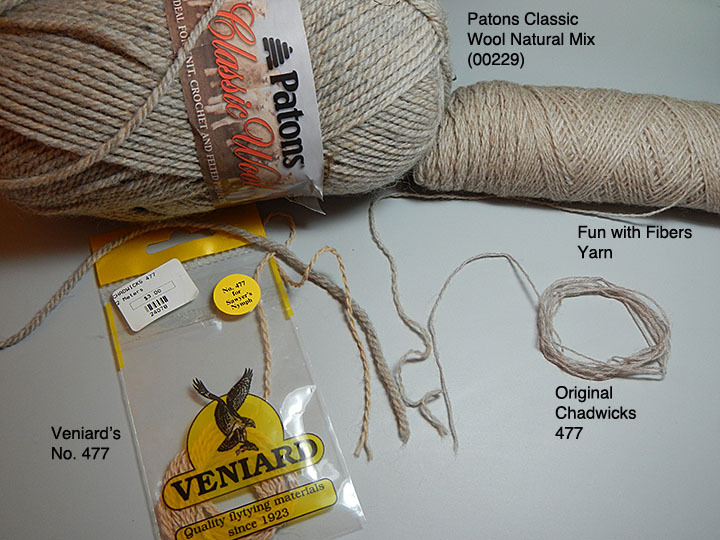 Then Patons Classic Wool Yarn (00229) Natural Mix, which I use for my K.I.S.S. Crane Fly Larva. It was that post and my request for a sample that now brings me to the end of the quest. Here are the comparisons. A close-up of the field. 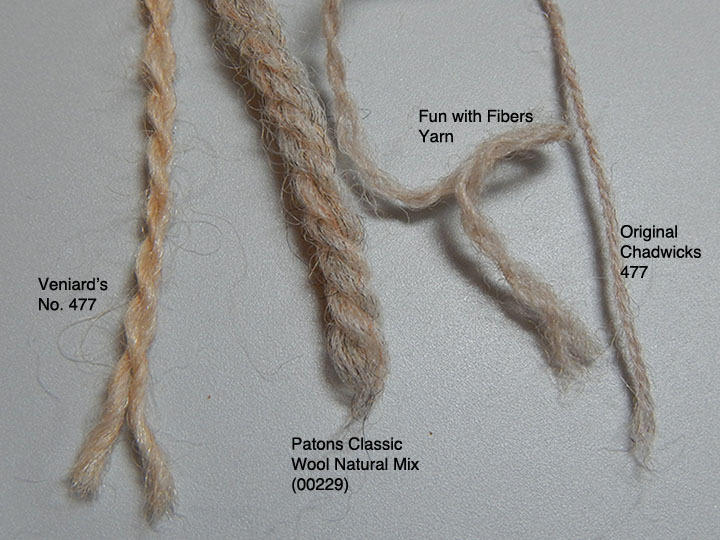 Now I think the winner is clear - "Fun with Fibers," but no luck finding any. I could not find any information on the yarn and there was no company information on the packaging. So the closest which you can buy is the Patons Classic Wool Yarn (00229) Natural Mix. The problem with the Patons is dye lots can vary and it's 100% wool, not the 85% wool 15% nylon blend found in the Chadwick's 477. Now the Venards is the furthest from the Chadwick's, but is that due to dye lot or year the yarn was manufactured? I don't know. One thing I do know is that Trout don't care if it's the genuine article. They only care if it looks and acts like food. It's up to the fisher to feel or see the take, strike and land the fish. So thanks to Richard I have a sample that I can compare to any other yarn when my supply runs out. Richard again thanks and cheers, expect something in the post.